Damn. I'm bone tired from the past few weeks of regular physical exertion. Last year at this time, when I was this tired, it was usually from being stressed out. No, this is a great kind of tired. I've been hiking from two to six miles a day, gone crawling under low footbridges, scaled forty-foot piles of boulders, been out on a forest trail in the middle of the night following tiny reflectors in my flashlight beam for miles on end, waded through plantations of poison ivy, tangled with forests of briers that left me lacerated and bloody, picked my way through deadfalls deeper and darker than Stephen King could imagine, encountered copperheads and black widows, and stumbled about in the dark trying to figure out how to get back to my car because I didn't enter a freaking waypoint. So far, I've got 134 geocaches to my credit, and that's small potatoes. Most of the folks I've gotten to know in this sport have thousands. I haven't been this worn out or satisfied in years. And the creative batteries are getting a really good recharging. *First to find! Took nothing, left nothing, signed log. Thanks for the cache! Some good company here. You may check out David Montoya's "Magus Press Diary" here. There's no time like your wife being in surgery to catch up on some reading. No, nothing real major this time. Peg's eyelids were drooping to the point they were cutting off her peripheral vision, so they did a trim job. She's recovering nicely. I have gotten hopelessly behind in my reading this year. I've spared way too little time for it, and my eyes have gotten so worn out from the intensive computer work I do at my office job (not to mention my writing) that even when I have time, I can't read very long without going cross-eyed. But while sitting in the waiting room, I took a few books with me, and number one on the list was Beth Massie's Brazen Bull — which has been sitting on the top of the stack for way too long. This is a nicely produced little chapbook from White Noise Press, with illustrations by Keith Minnion. And if you've ever visited Beth Massie's home, you'll know immediately where the cover art came from. Ms. Massie's characters are people we know. No; actually, they're just us — normal people living lives with ups and downs, the latter of which have overtaken the people in Brazen Bull to the point that they are close to falling apart. Down the street, an odd set of neighbors has moved in, and from our family's "reasonable" perspective, they seem rather sinister. The story unfolds through the eyes of Dorrie, a teenage girl with a good heart but a perspective skewed by the darker thoughts of her troubled father. He's not one of those ubiquitous terrible men that often populate horror tales; the dark thoughts that run through his head are thoughts any of us might have if suffering his circumstances. Some are born of prejudice, some are born of desperation. Massie brings everything down to a personal level, putting us, as readers, right smack in the middle of the family's plight, and it makes us damned uncomfortable. The resolution left me feeling a little hurt inside. Not due to any shortcoming but due to my caring enough about the characters to hope for them. 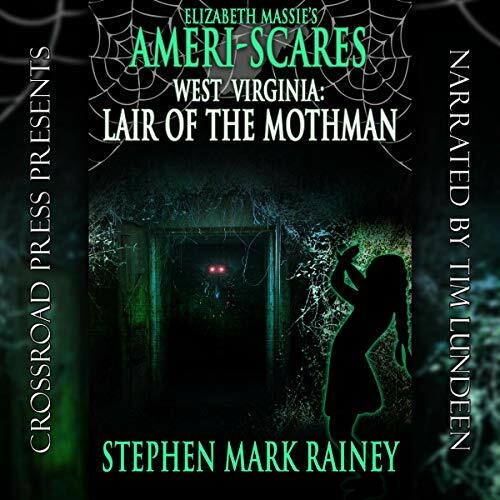 But no, this is a Beth Massie story. She's going to take you into the darkness and make you feel it. And if you know her work, you know this going in. 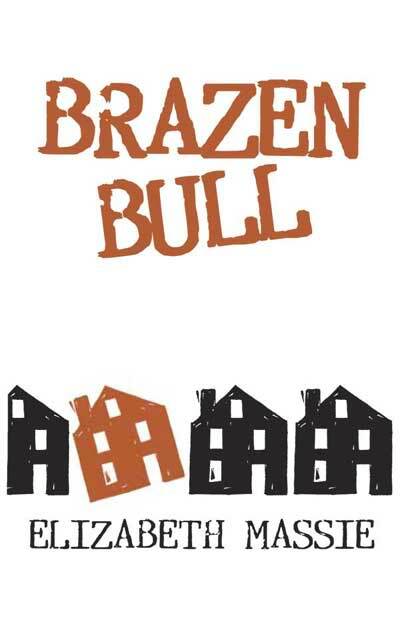 Brazen Bull is very short, and it feels as if it ought to be bigger, or a part of something bigger. That's not a bad thing — just a result of the tale drawing me in so thoroughly and kicking me around a bit. I'm not sure whether copies of the chapbook are still available, but it's a nice little package. If you can find one, grab it. Yesterday morning, I headed out to the Peninsula Trailhead, not far up the road, and joined with about 30 other geocachers for a cache-in, trash-out event. 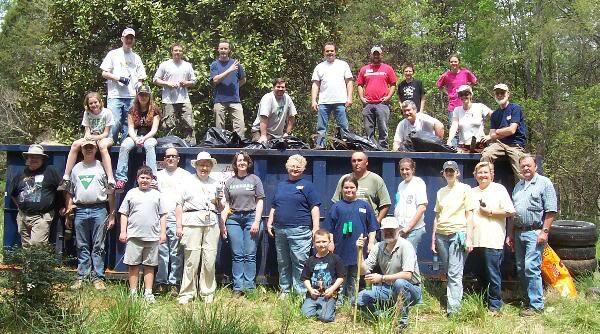 This was a pretty major cleanup of an area that had become nothing less than a trash dump over the years. The city donated a dumpster for use (see above), and at the end of the event, it was filled to capacity. I found what must have been someone's idea of a cache 50 years ago: a stash of bottles buried beneath a network of tree roots, a couple of which were still filled with their original contents (though I dare not guess what the stuff was). A few of the bottles looked quite interesting, and one young lady kept at least one of them for her collection. One soda bottle was labeled "Mission California," and I have no idea what product it actually contained. Afterward, I joined up with my friend Cindy (whom I used to terrorize...er, uh...work with) and her friend Aimee for about a five-mile trail hike and caching expedition. Found six, which gave me a total of 99; then last night, Mrs. Death, our friends Paul and Jamie, and I went out for a few more, so I hit the landmark 100, plus a couple. A novel plot is coming together from all this, though a fellow cacher said, "I know the kind of stuff you write. You can't do that to geocaching. You just can't!" Well...we'll just have to see where things go, won't we? I'll give you the coordinates when they're available. It's Better to Forgive, Right? Last night, I came about as close to doing something I'd regret as I ever have. Peg and I were heading down the highway near our house, and as we approached the pedestrian bridge down the way, I saw three kids hanging out watching the cars. Just as we reached the bridge, one of them shoved a rock or a large bolt through the steel mesh, which hit the top of my car just above the windshield. At the next exit, I turned around and went back toward the scene, and I saw one of the kids coming down the road; at least, I'm 99% certain it was one of the little bastards. I mean, logistically, it's barely feasible that anyone else could have been on the road where he was given the time and distance of my turnaround. But it's that 1% doubt that stopped me from getting out and flailing the little fucker with the bamboo stick I keep for geocaching. Instead, we called the cops, who came out, checked out the damage, and filed a report, which will accomplish a whole lot of nothing, but it was the more prudent course of action. Evidently, the gangs use that bridge as a hangout and charge tolls for people to cross. I know I'm in a minority, but personally, I think we ought to institute a National Shoot a Gang Member Day. Everyone gets a freebie. Something tells me it won't fly, though. Tonight we spent an enjoyable evening with the neighbors, getting in some caching and having a cookout. It was a great way to move on. A royalty check arrived from Wildside Books today. How handy, as Mrs. Death and I went out to a nice gathering of geocachers at J. Butler's bar & grill this evening. I killed off a passel of steamed oysters, sank a few Bass Ales, and logged a couple of caches. Also found a good-sized pearl in one of the oysters and lobbed it at Mrs. Death. It wasn't big enough to either do damage or particularly endear me to her, but I enjoyed it and would probably do it again. It's been one of those weeks, so I've been fairly scarce at the usual online haunts. Actually, getting away from the computer for several extended periods this week has been a much-needed tonic. After being shackled to the one at the office for way too many hours, I've felt compelled to keep my time on my home machine to a minimum. Instead, I've been using multi-billion dollar military satellites to find Tupperware in the woods, along with my neighbors, Paul and Jamie, who have been bitten by the geocaching bug. The exercise has been great, and the lacerations, bruises, poison ivy, and bug bites from traipsing through the woods in the middle of the night are really quite invigorating. However, in a disturbing repeat of events from two years ago, these past few days I've had several insects of the not-so-tasty variety buzz right down my throat. The one that got me today was fuzzy, bitter, and alive in my esophagus far longer than was comfortable. And as I was out hiking on a trail sans water bottle or any such luxury, I had nothing with which to wash him down. On the publishing front, Blue Devil Island has been remaindered by Thomson Gale/Five Star, so I ordered a bunch of copies to make sure I have some for future needs. And—gods willing—Other Gods ought to be appearing from Dark Regions in a few short weeks. Huzzah! Next person who says we're still in the middle of a drought, I'm going to swat them in the head. If we're still short of water, it's due not to lack of rain but the flood of human beings into the area. We've gotten so much rain in the past few weeks I can't get the water out of my shoes. Even the ones put away in my closet. Rain does not stop the dedicated geocacher. I spent the weekend in Martinsville placing a number of caches, included one multi-stage cache, wherein the cache-seeker has to find a number of micros, each of which contains clues to the next location until they reach the final treasure (the most valuable bit of which is a Three Stooges golf ball). I was out Friday night till after midnight (in the rain, with no shoes) setting up the caches in uptown Martinsville, then most of the day Saturday. I dropped another one out there this morning. Best thing of all though was encountering several geocachers today who were out looking for my hides. What a great bunch of folks; it was a real pleasure to meet them, and I hope we'll run into each other again in other secret places. I also made time to go hiking and find a few caches myself (yes, in the rain, dammit), work up some promotional stuff for Other Gods (which will probably be out within the next month or so), spend time with my mom, and get together with my friends, the Albaneses. Peg stayed home with the cats, so I'm sure she's had more than her hands full. I've also committed to being a guest at ZombieCon III in Chapel Hill (October 25—the weekend before Halloween). Time and location to be announced, so stay tuned. Well, of course your cat does. That's what cats do. They know things. 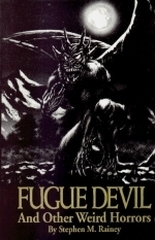 But tonight, we're talking about the Fugue Devil. If you know about it, it knows about you. And that usually spells trouble. Okay, not usually. Always. Recently, Mr. Jack "Trouble" Kincaid, took a break from chopping wood (which he doesn't mind) and composed a couple of ambient monstrosities based on my story, "The Fugue Devil" (which will be appearing, along with its sequel and other weird horrors, in my upcoming collection, Other Gods). I present the mp3s here, with Jack's permission. I find these nice for playing in the dark while things are otherwise quiet. Nice atmosphere. 'Tis better for cats to know. When not being menaced by cats and Fugue Devils this week, I've been tearing up Greensboro hunting geocaches. Along with Mrs Death and our next door neighbors (the Travelin' Farm Family), I've racked up a fair number of finds this week, including a few that had me pretty well flummoxed for several days. I really enjoy getting out and seeing parts of town that I've never seen in my 20 years here; walking (sometimes considerable distances) every day, sometimes on sidewalks, sometimes on wooded trails, sometimes through creeks; and having to think creatively, usually to figure out just how the hell somebody came up with such a devious hiding place. Tonight was a good one. It was raining in sheets, but the Farm Fam and I went straight out there, made a few finds (looking like drowned rats -- happy drowned rats, of course) , and then went out to Fisher's Bar & Grille for beer and chicken wings. At least the rain kept the muggles away. I fooled not a single soul today.